LED lighting technology is growing at a rapid rate and sometimes difficult to keep up with the new technology coming out. One specific new design is the diffuser mirror design built onto the tip of the LED bulb to create a cleaner beam pattern. Conventional LED bulbs do not have this feature available which is why the diffuser mirror design is superior in output. We are all accustomed to see conventional LED light output inside an assembly housing where the light is reflected onto the chrome background. The new diffuser mirror design has a similar design reflecting light but the light output is much greater. The angle the diffuser mirror reflects the light onto the housing reflector creates a concentrated and focused cut off line similar to projectors in headlights. Having a focused cut off beam will increase the visibility on the road as compared to conventional LED lights where output is spread unevenly. In the end, the high power LEDs are bright, conventional or not conventional; however, the concentrated cut off beam will definitely draw more future interests. 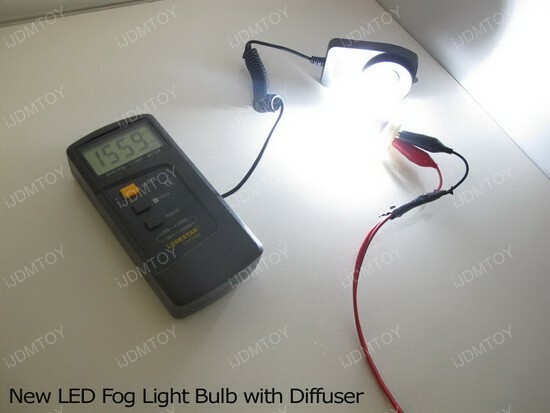 We have put the 10W high power LED with the diffuser mirror in comparison to a conventional 68-SMD LED fog light bulb and 50W CREE LED fog light bulb. We put all three of these LED lights in action using a lux meter to determine the approximate amount of lux output produced by each bulb. 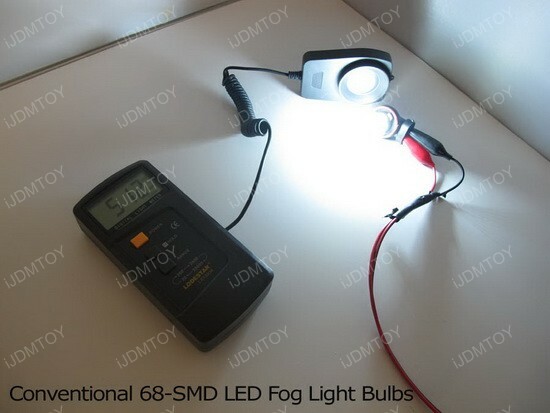 First up, the 68-SMD LED fog light bulb came out to a lux output of 512. Next, the 50W CREE fog light bulb came out to a lux output of 1334 which was two and a half times brighter than a conventional LED bulb. Lastly, the 10W LED with the diffuser mirror ended up with a lux output of 1559 which was three times brighter than the conventional 68-SMD LED bulb and slightly edged the 50W CREE bulb. Although these tests are just approximated outputs, the outcome and results will definitely change once installed into a reflective housing assembly. 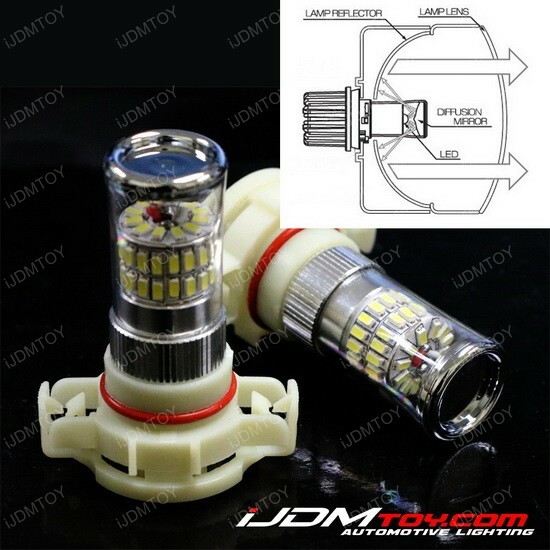 The high power LED with diffuser mirror will be available shortly at iJDMTOY. 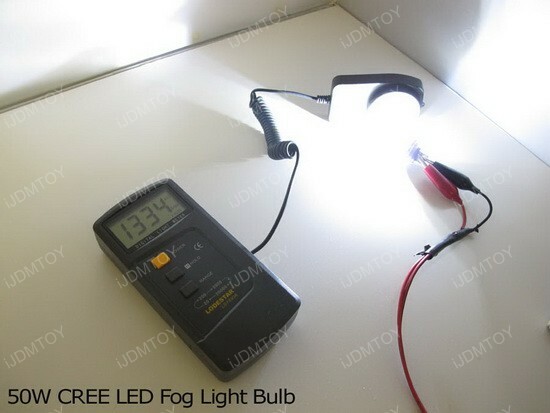 The difference in brightness is apparent compared to conventional SMD LED and CREE LED light bulbs. If you are looking for an alternative to achieve a cut off pattern then the diffuser mirror LED will do just that. This entry was posted in - LED & HID Updates and tagged diffuser mirror, fog lights, high power, LED, LED bulbs, LED Fog, LED lighting, led lights by Eric Wu. Bookmark the permalink.